The Hypotheses dashboard is where you manage the hypotheses in VWO. To access the Hypotheses dashboard, on the navigation bar, click Hypotheses under Plan. The Hypotheses dashboard lists down all the Hypotheses created by you. You can choose to switch between Progress View or List View. 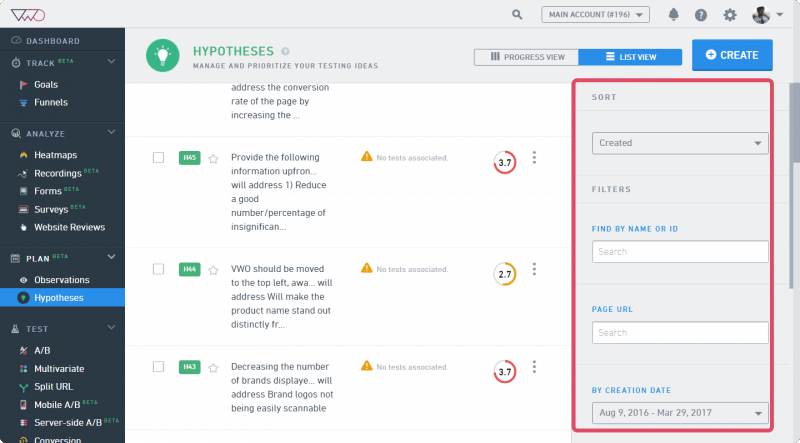 The Progress View helps you get an idea of the testing stage and status of your hypotheses. In this view, all the new hypotheses you create are listed under the Backlog column. You can simply drag and drop a hypothesis to another column to indicate the status of the test. Backlogs: The Hypotheses that are not ready to be tested yet go under Backlogs. Every new Hypothesis is first listed under Backlogs. Selected for Testing: The Hypotheses that are ready to be tested go under Selected for Testing. Drag a hypothesis to the Selected for Testing column when you are about to test it. Testing: The Hypotheses that are currently being tested go in here. Completed: Once your hypotheses are tested, they go under the Completed tab. Archived: The hypotheses that are archived go in here. Click the Create button in the upper-right corner of the Hypotheses dashboard. To learn more on setting up a Hypothesis, click here. If you select the List View, you can sort and filter the hypotheses using the sidebar on the right. Sort your Hypotheses using the following options. Created: Sort by date of creation. Updated: Sort by date of update. Filter your Hypotheses using the following options. Select LIST VIEW From the list of hypotheses displayed on the dashboard, click the check-box against the one you want to delete and then click Delete on the toolbar. Or, from the list of hypotheses, click the hypothesis you want to delete. After the detailed hypothesis appears, click the ellipses and select Delete. To edit a hypothesis, select it from the list. After the detailed hypothesis appears, click the ellipses and select Edit to make changes.